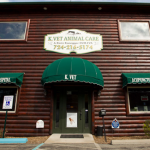 Since 2010, K. Vet Animal Care has served as Greensburg’s full-service community veterinary hospital. Founded by Dr. Alexandra Kintz-Konegger, K. Vet offers both Western and Eastern medicine in order to provide the best care for our patients. Our veterinary team cares for dogs, cats, avian and exotics. Our services include wellness exams, vaccinations, preventative medicine, diagnostic testing, microchip identification, acupuncture, laser therapy, herbal alternatives, general surgery, and dental care. We strive to provide the utmost care to each and every animal that walks through our doors. Since opening, K.Vet has grown considerably by welcoming Dr. Craig Hill, DVM, and Dr. Daniel Halden, DC. Dr. Hill specializes in exotics and avians, allowing our clinic to serve more clientele in the area. Dr. Hill currently sees regular appointments, as well as performs surgeries. Dr. Halden is an animal chiropractor that works part-time at our clinic on Tuesday mornings, Wednesday evenings, and Friday mornings. His chiropractic adjustments and laser treatments provide a new array of veterinary care for our clients. Feel free to browse through our website to learn more about our services and staff. As always, if you have any questions, feel free to call us at 724.216.5174. In the event of an emergency during office hours, please contact us immediately.